Pensacola State College Athletics would like you to become part of the Pirate Nation by joining the Pirate Booster Club. 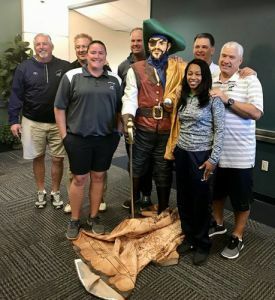 “We are kicking off what should be a great season of Pirates basketball, with the Pirates baseball and softball seasons soon to follow,” said Pensacola State Athletic Director Bill Hamilton. Entry-level Pirate Booster Club members receive a Dri-Fit T-shirt, access to free food and refreshments in the hospitality room during basketball games, special invitations to all club events, newsletters, and important information about the teams and players. “But that’s not all ─ all of our Booster’s receive lanyard VIP membership passes to include a guest at all our sporting events along with one free trip to the concession stand for you and your guest at any sporting events for the rest of the year,” Hamilton added. November is the time to join. To become a Booster, go to http://athletics.pensacolastate.edu/booster-club/give-now to receive membership benefits all season long.